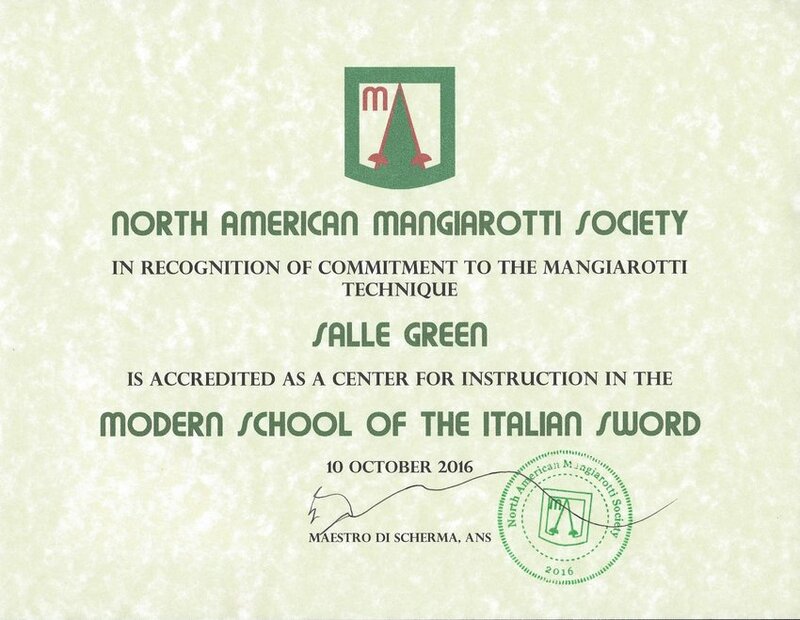 (1) One or more of the instructional staff must be endorsed by the North American Mangiarotti Society to instruct in one or more of the following weapons: Foil, the Sword (Epee), and/or Sabre. (2) The endorsed instructor must hold a current certification issued by the United States Fencing Coaches Association (or recognized by reciprocity by the USFCA), the Academie d'Armes Internationale, the International Fencing Coaches Association, or a recognized national academy of arms. (3) The club must teach the Mangiarotti Technique as part of its training program. This may be as an integrated component of athlete training, as a separate program for competitive or recreational fencers, or as clinics for fencers. (4) The club must submit an annual report of the training conducted in the Mangiarotti technique. (5) All instructors endorsed to teach the Mangiarotti Technique must complete at least 4 hours of approved continuing education each year. The accreditation application form is located in the column to the right of this text. Applications may be submitted at any time using this form. Applications must be approved by the head coach or owner of the fencing Salle, Club, or program, and include his or her e-mail address for confirmation (even if the individual submitting the application is the owner or head coach). Items 1. through 5. correspond to the requirements in the paragraph above - please review those requirements before submitting the application. The annual center report form is located in the column to the left of this paragraph. The intent of the report is to gather information about the extent of teaching of the Modern School of the Italian Sword nd to verify that Centers of Instruction remain active. Reports are due by 1 January of each year for the preceding year. 4. The club agrees to submit an annual report of training conducted in the Mangiarotti technique.